Smartphones have edged ahead of laptops for the first time as the preferred devices for connecting online in the UK, a report by Ofcom says. The communications watchdog said 33% of Britons opted for smartphones as the device of choice in 2014, ahead of 30% who preferred laptops. Ofcom said the toppling of the laptop was a "landmark moment". Data from studies in 2014 also suggests that Britons took 1.2bn selfies last year, it said. Some 31% of Britons said they had taken a picture of themselves in the past year, with one in 10 adults taking at least one per week, Ofcom added. 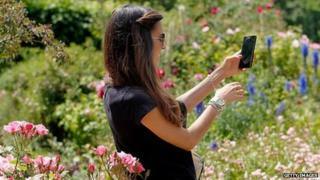 It said that the rise in smartphones with increasingly good cameras was potentially fuelling the craze. The smartphone was found to be more popular than the digital camera for taking and storing photos in 2014, with 60% of adults and 89% of 16 to 24 year olds using their phone for photography. However, just 29% of adults aged over 35 said they backed up their digital pictures, and 70% said they displayed printed copies of their favourites at home. Ofcom compiles its Communications Market Report every year to monitor the UK's habits. UK adults spent nearly two hours a day on average using the internet on their phones, according to its report. The margin of people who said they thought their their phones were "more important" than their laptops for connection online was small - 19% opted for tablets and 14% for desktop computers - but the change is still significant, said Jane Rumble, director of market intelligence at Ofcom. "We've reached a landmark moment where the smartphone has become the most important way for people to get online - just last year laptops were in first place," she said. By the end of 2014, 23.6 million people were using 4G mobile internet and more than half of them were using it to shop online. The study also found that 4G users did more banking, instant messaging and video clip watching on their phones than those without. In Britain, 90% of homes now have 4G access and that figure is set to rise to 98% by the end of 2017, said Ms Rumble. Just 2% of British homes still do not have access to even the most basic 2G mobile internet signal, she added. While tablet use is up by 10% on the previous year with just over half of households now owning one, the majority are not being used as mobile devices, said Ms Rumble. Image caption Just 5% of Brits had invested in a smartwatch. "They tend to be more family or household equipment, shared in the home, using wifi - they are very much home devices," she said. Despite the recent launches of high-profile smartwatches such as the Apple Watch and Pebble, wearables did not feature highly in Ofcom's report. "Less than 5% of UK adults own a smartwatch but given the rapid increase in 4G take-up, I think that is likely to be set to continue [to rise]," said Ms Rumble. The report also found that adults watched an average of three hours and 40 minutes of television each day on traditional TV sets - down by 11 minutes on the previous year. "We have seen a small decline... but we are still watching a lot of TV," said Ms Rumble.